EFFERSON, Pa. (June 4, 2017) – John Koester, 2016 Xtreme Class Champ, laid down unbeatable rides to take wins in both the Xtreme and Unlimited classes at the AMA Pro Hillclimb 2017 season opener on the White Rose Motorcycle Club's hill at Jefferson, Pa. 2016 Unlimited and Expert Singles Class Champ, Jay Sallstrom, took the round 1 win in Expert Singles. In Expert Singles Molly Carbon, the series only female rider, was the first to crest the hill, showing the guys how it’s done. Phil Libhart posted the first sub-nine ride at 8.838 seconds. Jay Sallstrom’s 8.291-second E.T. near the end of the order moved him to first, trailed by Libhart and Carbon. In the second half, Jack Mason wedged in between Libhart and Sallstrom with an 8.604-second ride. Libhart fell short on his second attempt and settled for third. Carbon bettered her first-half time by seven-tenths but it wasn’t enough to climb back onto the podium. Sallstrom took the win, followed by Mason and Libhart, second and third, respectively. In the Xtreme class, Koester rode fourth in the order and posted a blazing 6.527-second E.T., leaping into first by a three-second margin. Vinny Nuzzolilli, just back from a two-year hiatus, topped the hill in 7.241 seconds. Sallstrom bested Nuzzolilli with a 7.139-second time. Jockamo Baldina posted a 7.145-second E.T., moving into third behind Sallstom at the half. After intermission, Nuzzolilli posted a 7.084-second time and moved into second place. Sallstrom bested Nuzzolilli with a 6.734-second ride to take over second. Koester watched, waiting to see if he would have to defend his position. It was not needed- his first Xtreme class ride held for the win. He was flanked on the podium by Sallstrom in second and Nuzzolilli, third. Koester rode second in the order in the Unlimited class and topped the hill in just 6.274 seconds. Nuzzolilli posted a 6.891 E.T. but was bested by Sallstrom with a 6.329-second ride. Once again, Koester finished the half in first, followed by Sallstrom and Nuzzolilli. In the second half, Koester again waited and watched. Neither Sallstrom nor Nuzzolilli posted faster times, so Koester could relax. The Unlimited podium mirrored the Xtreme- Koester on the top step, Sallstrom to his right and Nuzzolilli to his left. 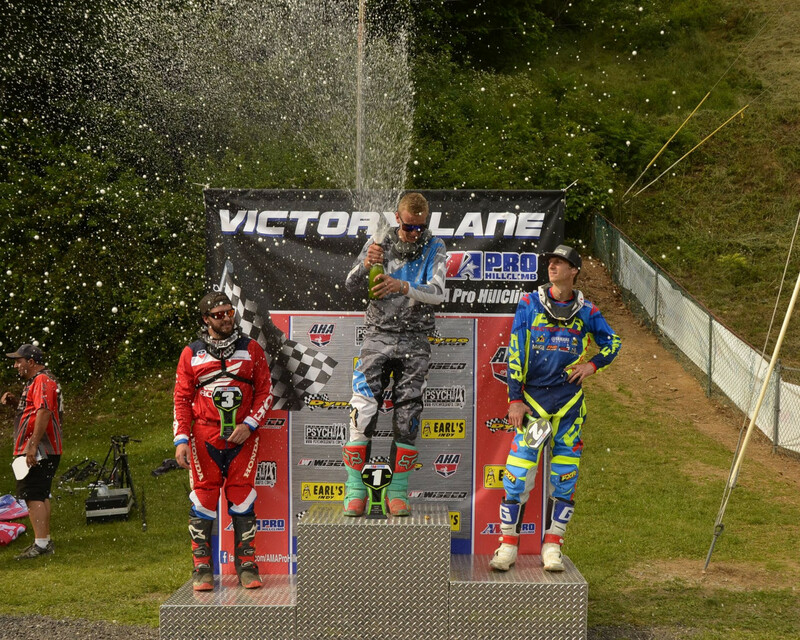 AMA Pro Hillclimbers face off again in one week at the Bushkill Valley hill at Freemansburg, PA on the June 11. The AMA Pro Hillclimb Series receives sponsorship from Wiseco, PsychMXGraphix, Dyno Port, and Earl’s Indy. U/L: 1. John Koester (Hon); 2. Jay Sallstrom (Yam); 3. VinnyNuzzolilli (Hon); 4. Jockamo Baldina (Hon); 5. Dave Price (H-D). Xtreme: 1. John Koester (Hon); 2. Jay Sallstrom (Yam); 3. Vinny Nuzzolilli (Hon); 4. Jockamo Baldina (Hon); 5. Cory Strickler (Yam). Expert Singles: 1. Jay Sallstrom (Yam); 2. Jack Mason (Hon); 3. Phil Libhart (Yam); 4. Molly Carbon (Hon); 5. Jockamo Baldina (Yam).